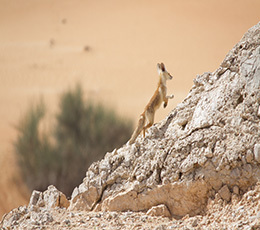 Arabian red fox den density, occupation rates, and habitat preference was investigated within the Dubai Desert Conservation Reserve. A total of 168 dens were located, of which only 64 were active. Dens sites were mainly established in sandy plains with predominance of Leptadenia pyrotecnica (order: family), with low human disturbance. A single camera trap was used on a rotational basis at six different dens to provide further insight into den utilization by Arabian fox.